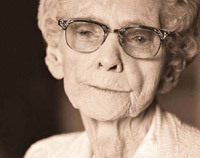 Over 1.6 million older Americans are affected with Macular Degeneration. Macular Degeneration – A disorder that affects the retina, the light sensitive lining at the back of the eye where images are focused. The macula—the area on the retina responsible for sharp central vision—deteriorates, causing blurred vision, which may cause problems such as difficulty reading, and for some, a blind spot in the central area of vision. The most common form of age-related macular degeneration is known as non-exudative, or “dry” form, which usually results in more slowly progressive vision loss. More rapid and severe vision loss comes from exudative, or the “wet” form, of macular degeneration, when abnormal blood vessels develop under the macula and leak fluid and blood. Both the exudative and the non-exudative forms of macular degeneration are age-related, and the leading cause of blindness in people over 50. Recent studies estimate that over 1.6 million older Americans are affected. The exact cause is unknown. Although age is the primary contributing factor to the development of macular degeneration, cigarette smoking and nutrition can also play a role in the development of age-related macular degeneration. There are also juvenile forms that are hereditary and also result in vision loss. Diabetic Retinopathy – Vision and/or visual functioning can fluctuate from day to day as a result of diabetes. Diabetes can cause blood vessels that nourish the retina to develop tiny, abnormal branches that leak. This can interfere with vision and, over time, may cause severe damage to the retina. Laser procedures and surgical treatments are used to reduce its progression, but systemic control of diabetes is a reputed factor. Retinitis Pigmentosa – Retinitis pigmentosa gradually destroys night vision, severely reduces side vision, and may result in total impairment. An inherited disease, it usually produces its first symptom—night blindness—in childhood or adolescence. Retinopathy of Prematurity (ROP) – Previously known as retrolental fibroplasia, retinopathy of prematurity occurs in infants born prematurely and is caused by high oxygen levels in incubators during the critical neonatal period. Retinal Detachment – Retinal detachment may result in total impairment in the detached area of the affected eye. It involves the retina separating from its underlying layer. Causes are holes in the retina, eye trauma, infection, blood vessel disturbance or a tumor. Through early diagnosis, most detached retinas can be surgically re-attached with partial to complete restoration of vision if surgery is performed in a timely fashion. Cataracts – A cataract is a clouding of part or all of the lens inside the eye. This clouding interferes with light reaching the retina at the back of the eye, resulting in a generalized loss of vision. Causes are aging, long-term exposure to the sun’s ultraviolet radiation, injury, disease and inherited disorders. If the eye is healthy, a cataract can be surgically removed and vision restored, usually with intraocular lens implants. Cataract surgery has a high success rate in otherwise healthy eyes. However, there are still individuals for whom cataract surgery is not possible as well as those with other ocular diseases(s) that may require low vision rehabilitation to maximize the remaining vision. Glaucoma – Glaucoma is a form of damage to the optic nerve, which can result in vision impairment. The optic nerve damage in glaucoma can be due to the internal pressure in the eye building up because of problems with the flow or drainage of fluid within the eye, or can result without increased intraocular pressure (normal tension glaucoma) due to insufficient blood flow to the optic nerve. There are no early symptoms in the most common form, but the first signs of damage are side (peripheral) vision defects and difficulty with night vision. Early diagnosis and treatment with drugs or sometimes surgery can minimize vision loss. Acquired (Traumatic) Brain Injury – Vision can also be lost or damaged as a result of head injuries, brain damage and stroke. Signs and symptoms can include reduced visual acuity, visual field, or contrast sensitivity, blurred vision, eye misalignment, poor judgment of depth, glare sensitivity, confusion when performing visual tasks, difficulty reading, double vision, headaches, dizziness, abnormal body posture, and balance problems.